There are times when we take pictures just for the fun of it. Times where we take them to remember a moment. Times where we take pictures to make a statement. And then there are some pictures we take that we don’t even realize the importance until later. 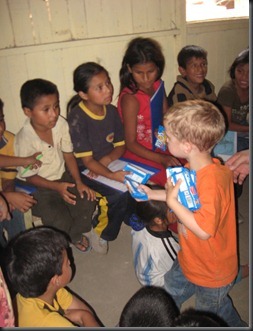 This top picture is of my (then) 3-year old on our trip to Peru in 2008.We were visiting friends of ours who were serving the people of Peru through a missionary organization. On one of the days we had the privilege of visiting a community they were working in; a very poor community as you could imagine. We were simply there observing and learning about the ministry, but we had the opportunity to help as well –in the form of handing out food to the many, many kids who had come. Robbie (the 3 year-old) wanted to help hand out food, and as you can see from the picture, he did a great job. Why does this picture mean so much? I was proud of my little buddy for helping but it was more than that. It is a reminder of my role as a parent and my kid’s capacity for learning. Even at 3 years of age Robbie knew there was something to this helping thing. Of course he didn’t fully understand why he was doing it but there was a seed planted in his head and, more importantly, in his heart; a seed that hopefully will keep growing along with him. My role as a parent (along with my wife, Heidi) is to continue to give he and his siblings opportunities to serve and to learn. We can’t make our children be compassionate, but we can try to a) show them what it means to serve people and b) put them in environments where they can be active participants. This second picture was taken in Nicaragua just a few weeks ago, on a trip with Radius Church. The team was split into two parts: a construction team and a medical team. This particular day I was with the medical team helping to translate. (stop laughing). The doctor was having to put stitches very close to a teenage boy’s eye, with the boy lying on a picnic table, and another team member, we’ll call him Michael, was holding his hand and doing his best to keep him calm. You can see ‘Michael’ in the picture with the boy. I specifically left off the boy’s head because I realized that because of ‘Michael’s heart for people, his compassion for children, and God’s grace that flows out of every pore of his body, any child could be sitting on that table and Michael would hold their hand all the way through it. Luckily no one was paying any attention to me because I actually had to leave and go to another section of our little clinic to avoid the tears in my eyes being seen. Why the tears? Because I was picturing one of my children on that table and I know with out a shadow of a doubt that if I needed him to, ‘Michael’ would do the same thing for them……and for yours as well. During that trip, I saw many people step up and do what God has called them to do. ‘Michael’ wasn’t the only one. But in that moment, it felt like one of God’s purposes in ‘Michael’s’ life was coming to fruition and I was able to be a witness to it and bring back a tiny snapshot of it. I changed the name to “Michael” because I didn’t ask him if I could write a blog about him and show his picture. Those of you at Radius know who he is and will agree with everything I’ve written.